As a former language teacher, I love words – speaking them, writing them, hearing how others use them when talking or writing. One “red flag” filter I have developed over time, however, targets “50 cent” words that sound important but that leave us with a gray feeling of uncertainty. These words have definitions, to be sure, but the concepts they purport to articulate are too vast to be contained in a tidy linguistic package. One such word that has been swept up (and possibly out to sea) by the hurricane of our collective soul-searching as educators in the 21st century is “innovation.” It’s a great word, and an even better concept; as such, it deserves our collective, conscious effort to define what it looks, sounds, and feels like – not to be treated as filler for important sounding talk that leaves everyone with only a fuzzy sense of what was just said. As my contribution to #leadershipday13 – a truly innovative (uh oh – I said it!) idea – I want to share my definition of what it means to be an innovative educational leader. This gets to the title of this post – to be “innovative,” a leader needs to be more than a person with ideas, conviction, and a belief that everyone can learn and grow; they need to be agents of convergence. “Innovation” is, simply put, the adaptive solution that emerges from thinking about a question, challenge, or aspiration. Of course an individual in isolation can be innovative, but it is the convergence of multiple perspectives, ideas, experiences, and talents that make the adaptive solution all the more profound and sustainable in the context of the organization’s function. So what is it that an “agent of convergence” does to infuse a culture of innovation in their organizations? 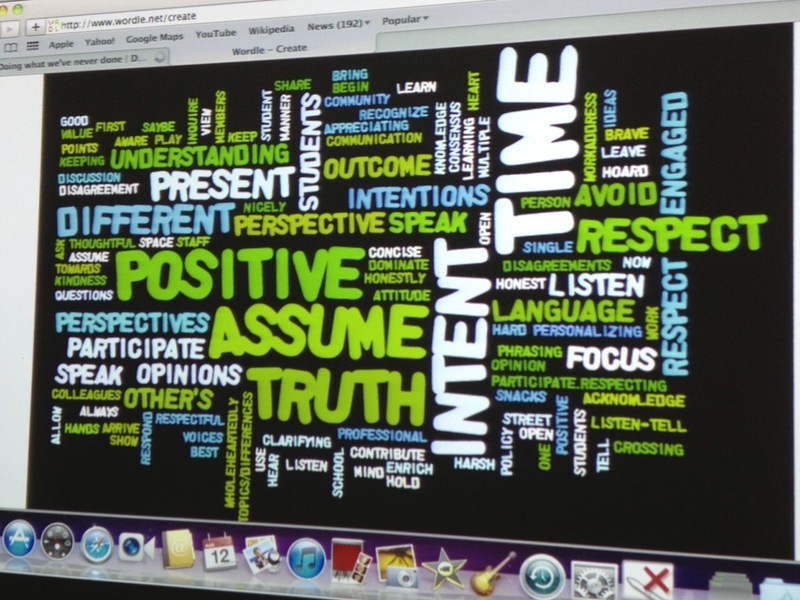 1) They shift the focus from the tool to examining how to create the best learning environment. This powerful point was shared by @JessicaKParker during a session at the inaugural Edcamp Marin. There is an overwhelming amount of tools we can use, but they aren’t much good if their use lacks purpose. Forget about our contemporary, device-intensive correlation of the term “technology” for a moment (electronic devices connected to the web) and think of anything we use to enhance the learning space as technology worth leveraging. 2) They look closely at the gathering spaces at their schools. Agents of convergence know that ideas come from people getting together and talking – spaces that foster “serendipitous interaction.” Take a look at your staff lounge, or the room where teachers make copies – are they inviting? Are they inspiring? Are they cluttered disaster zones better served to archeology? Or…do they look anything like any of these spaces? (Link thanks to Scott McLeod!) Do they provide space for people to write/draw/doodle/share? (Link thanks to colleague @drakemtbdan) What about the growing trend to ditch desks in favor of more open, flexible classrooms where physical movement (and movement of ideas!) is more fluid? 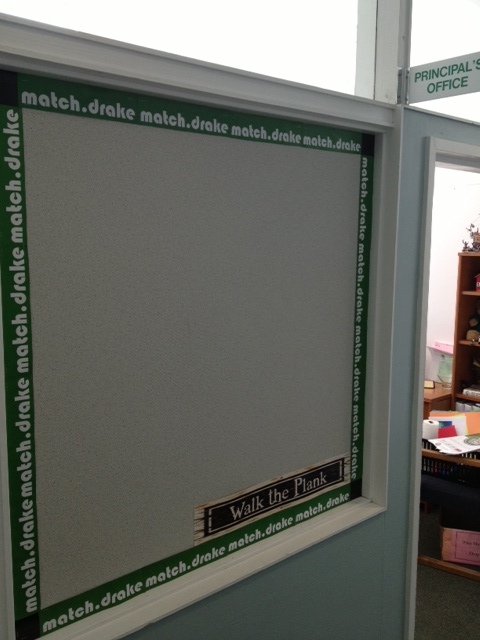 One idea we’re trying this year at my school is this “match.drake” bulletin board outside the Principal’s Office, a spinoff of the online dating site. The purpose? To get our teachers posting “classifieds” of ideas they have and want to partner on. I don’t know – maybe a Spanish teacher who wants to do a lesson on the Spanish Civil War teaming with a World History teacher, or a Geometry teacher wanting to incorporate study of Kandinsky and Mondrian. Who knows – maybe their ideas will spark other connections. Convergence! 3) They model 21st Century “gathering spaces.” Okay, here’s where digital technology comes into play! Leaders have an incredible opportunity – better said, obligation – to model how to use Web 2.0 and social media to connect, learn, and share in the global conversation on education. As we remove boundaries in our physical space to promote human connection, so must we open up doorways between our campuses and the incredible thinking and learning going on everywhere else. Here is our school’s “all-call” to promote connectedness with all layers of the community. 4) They embrace Conflict, Disagreement, and Dissent. I’ve posted on this earlier. I’ll keep saying it until I’m hoarse; people will not open up to each other – in small groups and large – unless they sense that disagreement and conflict are healthy, productive, and compassionate. There can be no convergence until there is a safe, comfortable space for honest, respectful dialogue. You know the expression: “Culture eats strategy for breakfast.” Yep. 5) They love working alongside students. Period. Leadership is more important now than ever. There are rifts developing w/in school staffs between those that are comfortable deconstructing education as we knew it and those that aren’t. Agents of convergence don’t pick sides – they continue bringing everyone together. The shift is slow and it’s natural to feel impatient (see Gawande’s great piece on why some great ideas are so slow to catch on). Innovative leaders create the conditions for adaptive solutions to new and emerging questions, challenges, and aspirations. And they just can’t help but be FIRED up about it every day! Posted in Leadership, Organizational Growth and Change, School Culture, Social Media & Growth, Teaching, Technology in Education, UncategorizedTagged Change, convergence, Gawande, Growth, ideas, Innovation, learning spacesBookmark the permalink.